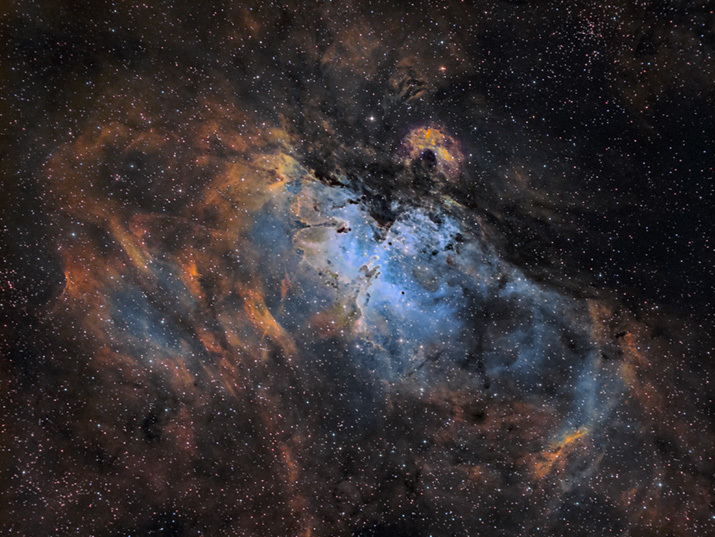 M16, also known as the Eagle Nebula, is located approximately 7,000 light-years from Earth in the constellation Serpens the snake. It is an especially interesting astronomical object that has been the subject of much research conducted using both ground based and space based observatories. The nebula is in its latter stages of evolution. Many massive stars condensed out of the great cloud of gas and dust that composed the original nebula. These massive stars now radiate huge amounts of ultraviolet light. This radiation excites the surrounding gas which then radiates visible light of a wavelength specific to the chemical elements comprising the nebula. The radiation pressure and stellar winds from these stars "blew away" much of the nebula's gas creating a huge central cavity in which the stars now shine. The "fingers" of gas in the middle of the image are much like the formations we see in the deserts of the southwest United States. It is believed that very dense pockets of dust and gas located at the tips of the columns act as "capstones" protecting the gas below them from the radiation and stellar winds of the massive stars visible above and to the right of the pillars. These "fingers/pillars" are home to many observed protostars and are know as the Pillars of Creation. A massive supernova explosion may already have destroyed these spectacular pillars and nebular structures. Observations by the Spitzer Space Telescope indicate a massive star exploded approximately 8,000 to 9,000 years ago. The light from the supernova would have reached the earth between 1,000 and 2,000 years ago, however, the slower moving shock wave would take a few thousand years to propagate through the nebula. It will be approximately another 1,000 years before the light showing the destruction of the â€œPillars of Creationâ€� reaches the Earth. The image above was assembled from data taken through narrowband filters. Sulfur II is mapped to Red, Hydrogen Alpha is mapped to Green, and Oxygen III is mapped to Blue. The stars were overlayed with data obtained from a near true color Ha/OIII/OIII image.